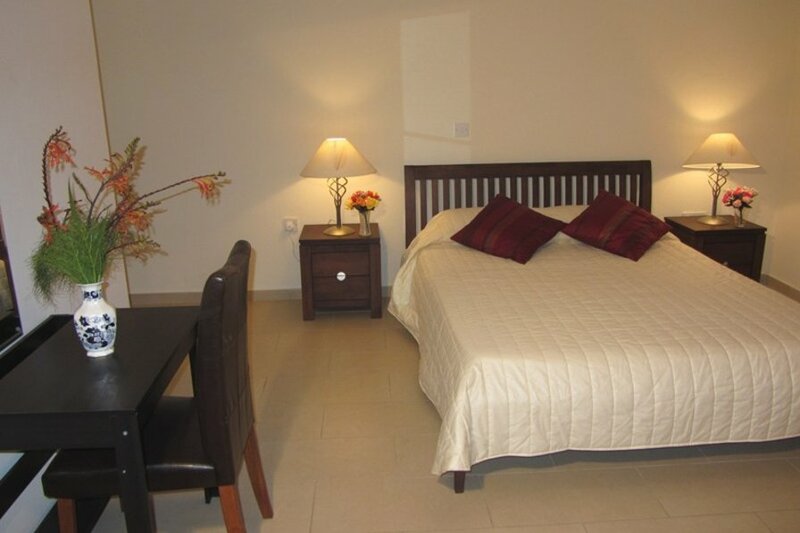 Orfeas 3 bedroom apartment is a luxurious first floor apartment with lovely sea views and a communal swimming pool. Situated on a small complex ideally situated within walking distance of local shops,large supermarket and beach. This spacious light and airy apartment has been interior designed throughout with contemporary furnishings and is fully air conditioned (free of charge) It has 2 twin bedrooms with fitted wardrobes and a master bedroom with double bed,fitted wardrobes,en suite shower/toilet and sun terrace. There is a family bathroom with bath/shower and toilet .The modern kitchen is well equipped with brand new utilities including a washing machine, fridge/freezer, cooker and hob. The sitting /dining room is open planned and furnished with contemporary leather corner suite and dining for 6. Leading from the lounge and bedroom 2 through sliding patio doors is a large 36 square meter sun terrace furnished with a table and chairs for 6. An allowance of 50 KWh of electricity is allowed per week, any use over this will be charged as an addition and deducted from your security deposit. On arrival we will show you the electricity meter, you are welcome to take your readings on arrival and on exit. There is outside lighting for this area so you can enjoy the lovely warm summer evenings and dine in style. This 1st floor apartment can be accessed by the lift or stairs and is suitable for both families or the elderly. The local bus stops nearby for those who prefer not to drive.